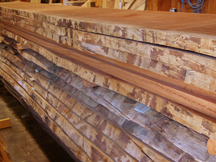 Softwoods are coniferous (evergreen) trees, most of which grow in temperate to cold climates. They often mature more quickly than many deciduous hardwoods and many take to being farmed quite handily. Often fast-growing and commonly available from sustainable sources, softwoods such as Douglas Fir, pine, cedar and the like are excellent choices for many projects. 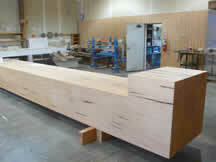 Douglas Fir is the standard species for engineered wood members, and in the higher grades it is often used by us as veneer stock. Hardwoods are deciduous (leafy) trees, shedding their leaves during the colder months. All hardwoods have a more complicated grain structure than softwoods, with large pores that occasionally result in striking “ray fleck” patterns, especially when quartersawn. Classically found in furniture and flooring, hardwoods such as oak, cherry, walnut or beech can also be used to create beautiful interior spaces. Such species are oftentimes employed by us as veneer stock to maximize yield from choice logs. 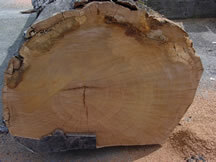 We at the GR Plume Company are familiar with a wide variety of tropical species; teak, mahogany, lenga, ipe and others. Each has its own unique idiosyncrasies, and many species require specialized tools for milling (due to their density and hardness). We endeavor to use materials that are responsibly and sustainably harvested; for this reason, significant lead-times can result for the more exotic species.